The EU and EMU indexes compiled by the EU Commission show gains in February but small gains. After a period of deceleration dating from mid-2015, the EMU area and its largest economies have stabilized and now are showing several months of consistent gains. Most member countries have had an on/off pattern of gains tilted to net gains over the past six months or so. But for the EMU as a whole, there is a series of eight months in a row when the overall index has gained month-to-month without fail. But that process is wearing thin as the EMU has managed gains of only 0.1 index points in each of the last two months. Still, Germany, France and the whole of the EU are now posting year-over gains in their sentiment indexes and while Italy has trimmed its losses; it is only back to where it was about 12 months ago. Sector gains over the past year are generally more concentrated in the last three months, especially for retailing and services. However, retailing is rebounding from a previous three-month period when it had been slipping. Most EU sectors have made the bulk of their gains over the last six months. All this tends to underscore the view that momentum is in reasonably good shape. The four largest EMU economies (Germany, France, Italy and Spain) have made most of their gains over the past year in the space of the last six months- only Italy is an exception to that. The percentile standings tell us that according to their own respective histories the retailing sector is doing the best followed by consumer confidence and by the industrial sector. Construction and services are experiencing more modest revivals. The relative best performing countries are Malta, Cyprus, Slovenia, Portugal, Spain, and Germany, in that order. The small countries have a shorter period for their evaluation. Greece is an outlier in terms of its low standing relative to its historic norms. 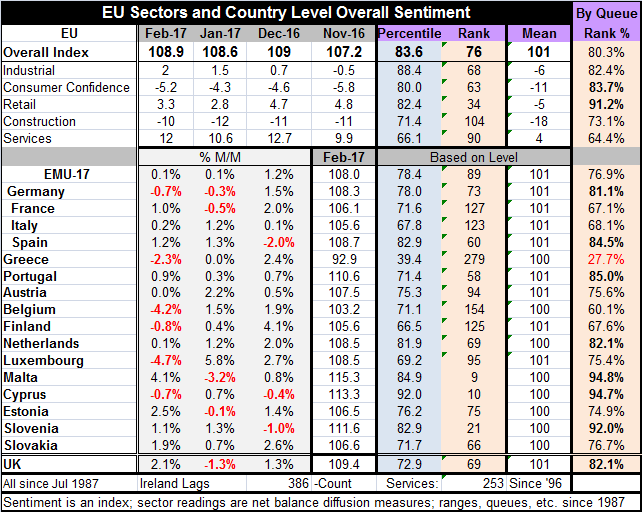 Belgium, France, Italy and Finland have relatively modest but still reasonably firm standings for their overall sentiment. None of the EMU national sentiment ratings is worrisome in its weakness except Greece for well-known reasons. If there is a concern about growth, it is the relatively weak 64th percentile standing for the EU-wide service sector. However, that standing is mostly attributed to EU-only members as the services standing for the EMU is in its 89th percentile. France and Italy have the lowest percentile queue standing among the large four economies and each is in the middle of political shifting. In France, most of the early front runners have now been forced to step down, leaving France with a slate of lesser-known candidates for office. Marine Le Pen, of course, has benefitted from this political triage, but it is widely believed that she will remain a fringe candidate and she has recently come under some scrutiny herself. Still, she is a separatist and in the thick of things. In Italy, the separatist Five Star Movement has gained some strength and even Germany, with its own election cycle playing out, has experienced some backlash but mostly from conservatives. Regardless of election results, Europe will have to address the issues that have led to this kind of national discord even if no separatist is elected anywhere. Europe still needs to figure out what it will be when it grows up. Right now European nations are still jostling for position and influence. When the EMU was formed, each nation sought to get what it could from the new relationship rather than to try to make the overall mechanism work. Some chose badly and have wound up mired in austerity programs to mend their ways. Getting things wrong in a currency union is painful because there is no magic bullet called exchange rate depreciation. Germany understood the workings of the new system from the start and burrowed deeply into the zone finding a place of protection as the most competitive country in the EMU. It benefited further from the troubles of its neighbors as the euro has sank in value. Germany has been the most successful exploiter of this new arrangement and it has also had to bear the financial brunt of the community's needs. It is not surprising to see countries pursuing their own interests. But the EMU is an arrangement that creates pooled interests for community-members and still there will be within EMU winners and losers. It seems that Europe has not yet developed a way to deal with that fact. And there is no fiscal transfer mechanism to soften the blows when they land. While Germany has created a comfortable pocket of competiveness within the EMU, it is doing so well that it has created a huge current account surplus for itself and yet Germany refuses to take action to fix that even though it is obligated to fix it and even though the German surplus is a problem for fellow EMU members. The EMU has done everything it can to avoid having an added weight of taxes or to institute a common fiscal policy. But it should be clear that they already have intertwined fiscal arrangement and some of them are playing out through the ECB. Other simply transfer burdens though the existing (even if separate) fiscal structures. Europe needs to refine what it is and what the EMU can look like if it is to survive. A common currency with every man for himself simply is not cutting it. And now with the U.S. pushing more responsibility down onto Europe for its own defense and with Donald Trump planning to clamp down on other nations' exploitative trade and financial policies, the global environment is going to become more challenging. That means that the EMU area is going to have to have a better sense of fair play within its borders as well if it is going to roll with the punches from the changes that lie ahead.